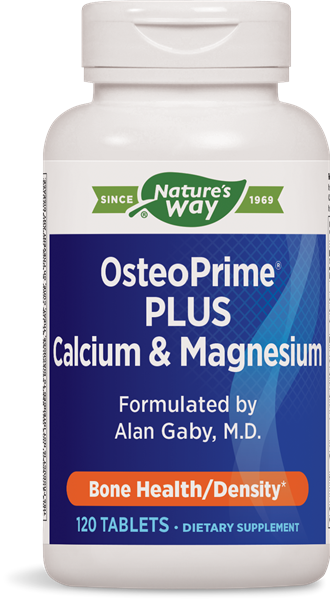 OsteoPrime® PLUS / 120 tabs - Nature's Way®. Why use calcium and mineral formulas? Take 4 tablets daily, or as recommended by a healthcare professional. Why so many types of calcium in this formula? Simply put, more forms of calcium ensure more complete availability in the body. Each calcium salt—that is, each calcium attached to a different mineral—offers differing quantities of elemental calcium. Elemental calcium is the “bottom line” amount of calcium you absorb from food or a supplement. And while some calcium/mineral combinations have more elemental calcium than others, they’re not always easy to absorb. For example, calcium lactate is about 32 percent absorbed while calcium citrate is approximately 30 percent absorbed. Tricalcium phosphate is an important addition to the formula because is the most prevalent form of calcium in human bone. Why does OsteoPrime® Plus contain MK7 rather than MK4? Long-term safety has not been determined with MK4. MK7 has a longer half-life (it lasts longer in the body). Why would someone take OsteoPrime® Plus instead of OsteoPrime®? If pregnant, nursing, or taking Coumadin®‡‡‡ (warfarin), or any medications, consult a healthcare professional before use.